Resident rates are offered to those living within the Deerfield Park District boundaries and Riverwoods. We require photo identification to verify eligibility for resident rates. Rental Clubs are available in the Pro Shop. Rental costs are $15 for 9 or 18 holes. 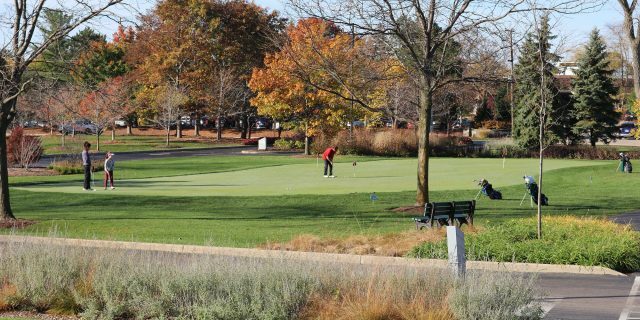 Tee times are available by phone 7 days in advance by calling 847-945-8333 or Book Online. Effective January 1, 2019 the eligible age for Senior Green & Cart Fees will be 65. (C Pass) Resident Senior Class C pass holder every year since 2006 ONLY. *Effective January 1, 2019 the eligible senior discount age for non-renewal golf passes will be 65 years of age (2018 Passholders 62+ will be eligible for the current senior pass for each consecutive year they renew their pass until age of 65). Golf pass holders of A, AA, B, BB, C, CC, and C6 may play also play at the Deerpath Golf Club for only a fee of $27 walking or riding. Weekdays anytime and Weekends after 2:00 pm. See PDF below for more information!